more and more frequently consumers are victims of telephone spam or frauds, or are simply provoked by frequent unwanted calls. They use various tricks to pull our money out of our pockets. Here in our community, many phone owners report and rate the numbers that called them, sharing their experiences with other users to protect you and themselves. This works in an easy and uncomplicated way. The heart of us is the tellows score. It is calculated from all previously stored ratings for a specific phone number. Users of the community can report and rate phone numbers on a scale of 1-9, where 9 means that a very dangerous or very annoying phone call is on the line and 1 is a rather harmless one. So you can rate and categorize each phone number on a scale from 1 (trustworthy) to 9 (dubious). From 7 on, the corresponding phone number is placed on a blacklist of the community and is thus blocked for everyone using the tellows products by itself and provides an appropriate protection. Depending on the rating, you can then assess the seriousness of a called number. In this way you can inform yourself online about the experience other users have already made with the respective number. And if there is a cost trap or telephone fraud behind it, you can know it because of the negatively rated number before they call you back again. Additionally, you can create your personal blacklist and add unwanted numbers that are not yet rated or don’t appear in the blacklist. If you rate a number negatively, it will be added to your personal blacklist and will be blocked the next time you receive a call. Even if the overall rating assigned by other tellows users of the phone number is different, it will still be blocked. In order to be able to benefit from the collected assessments and experiences at an early stage, for example even before a call is answered, the successful tellows app for devices with Android or iOS was developed. This already indicates during the ringing, how trustworthy the calling number is by using the reports of the community. Thus, when the call is received, the tellows score is displayed. This entry was posted in General and tagged android, app, blacklist, block phone calls, caller ID, cross device, iPhone, member area, registration on Friday October 5th, 2018 by tellows.de Team. 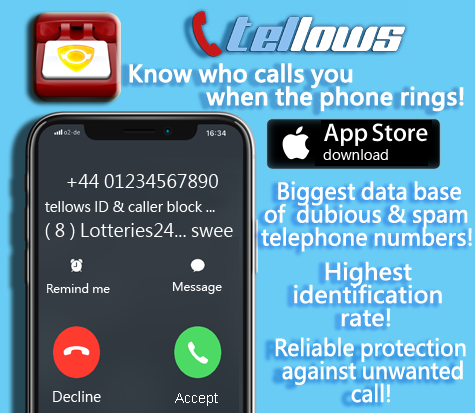 Dear tellows fellows, starting today a new tellows iPhone version for “tellows Caller ID & Block” is available in the App store: 1.4.0! The app works for all devices using iOS 10 or higher. Version 1.4.0 comes with an improved protection from unwanted phone calls, thanks to some new features. You have the ability to log in to your own tellows account and easily access it from multiple devices. You can also edit your account settings and posted comments, when you log in to tellows in the web browser. Additionally, you can now create your personal blacklist and add unwanted numbers that are not yet rated or don’t appear in the blacklist. If you rate a number negatively, it will be added to your personal blacklist and will be blocked the next time you receive a call. 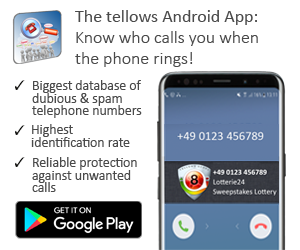 Even if the overall rating assigned by other tellows users of the phone number is different, it will still be blocked. You must be logged in to use this feature and synchronize your personal blacklist with your device. You can use your one personal blacklist across all devices and tellows products. This entry was posted in App suggestion, General and tagged blacklist, block calls, Call Blocking and Caller Identification, caller ID, free app, iPhone App, mobile solution, tellows app on Friday May 25th, 2018 by tellows.de Team.